Young Boys has over 2.5 goals in their last 6 away games in all competitions. Juventus has under 2.5 goals in their last 3 games in all competitions. Valencia allowed opponents to score over 1.5 goals in last 3 games in all competitions. CSKA has under 2.5 goals in their last 3 games in all competitions. Roma has over 2.5 goals in their last 5 home games in all competitions. Viktoria Plzen lost their last 3 away games in all competitions. Juventus won their last 7 games in all competitions. Viktoria Plzen has over 2.5 goals in their last 3 away games in all competitions. Roma scored in last 7 home games in all competitions. Viktoria Plzen didn’t score in last 3 away games in all competitions. Lyon scored in last 5 games in all competitions. Shakhtar allowed opponents to score over 1.5 goals in last 4 away games in all competitions. Valencia allowed opponents to score over 0.5 goals in last 3 away games in all competitions. CSKA scored in last 5 home games in all competitions. CSKA scored in last 10 games in all competitions. Shakhtar allowed opponents to score over 1.5 goals in last 5 games in all competitions. Valencia has under 2.5 goals in their last 5 games in all competitions. Manchester United scored in last 6 games in all competitions. CSKA allowed opponents to score over 1.5 goals in last 6 home games in all competitions. Juventus won their last 4 home games in all competitions. Young Boys won their last 9 away games in all competitions. CSKA allowed opponents to score over 1.5 goals in last 3 games in all competitions. Benfica has over 2.5 goals in their last 5 away games in all competitions. Benfica scored in last 3 games in all competitions. Bayern Munich has under 2.5 goals in their last 5 games in all competitions. Bayern Munich scored in last 10 home games in all competitions. Benfica scored in last 18 away games in all competitions. AEK Athens scored in last 16 home games in all competitions. Benfica scored over 1.5 goals in last 6 away games in all competitions. Bayern Munich allowed opponents to score over 1.5 goals in last 7 home games in all competitions. 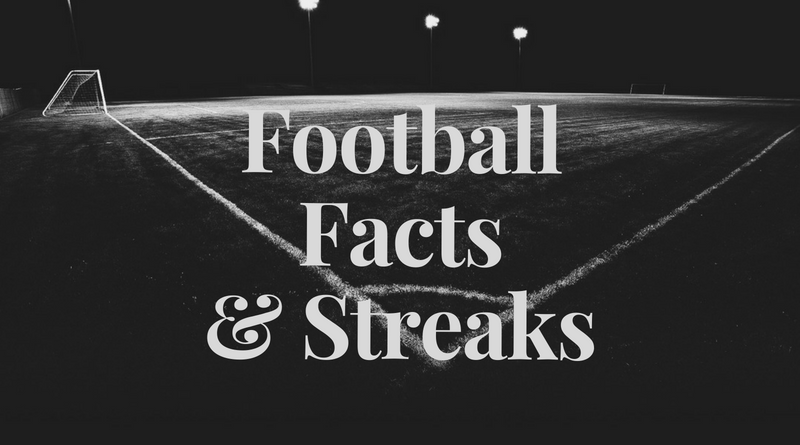 Parana Clube has under 2.5 goals in their last 12 home games in Serie A (Brazil). Parana Clube lost their last 3 games in Serie A (Brazil). Vasco da Gama scored in last 3 games in Serie A (Brazil). Parana Clube didn’t score in last 3 games in Serie A (Brazil). Vasco da Gama allowed opponents to score over 1.5 goals in last 4 games in Serie A (Brazil). Hull City scored in last 3 home games in Championship. Leeds United allowed opponents to score over 1.5 goals in last 3 away games in Championship. Reading has over 2.5 goals in their last 3 home games in Championship. Preston North End has over 2.5 goals in their last 6 games in Championship. Preston North End lost their last 5 games in Championship. Aston Villa scored in last 5 games in Championship. Brentford scored in last 11 home games in Championship. Brentford scored in last 7 games in Championship. Leeds United scored in last 5 games in Championship. Reading has over 2.5 goals in their last 5 games in Championship. Aston Villa scored in last 17 home games in Championship. Brentford has over 2.5 goals in their last 3 games in Championship. Reading scored in last 3 home games in Championship. Brentford scored over 1.5 goals in last 3 home games in Championship. Leeds United scored in last 11 away games in Championship. Reading scored in last 5 games in Championship.